For this week's Twinsie Tuesday, the challenge was to try something new, whether that something is a colour, a brand, a nail art technique... For this week's Twinsie Tuesday theme, I learned how not to do acid wash nails. I've had this technique on my to-try list for a while now, and I'm definitely going to be trying it again before too long. This time, though, I might have overcooked it by using too many polishes. The colours looked awesome lined up together in a row, but once they were all on my nails, it was juuuuust a bit thick. Definitely cool! But thick. I put way more layers into these than I needed to, starting two coats of Bandi Alpine White out of habit, just knowing there were some neon-ish shades to come. Totally unnecessary. Then OPI In My Back Pocket (orange) with a layer of SV so I hopefully wouldn't eat away too much polish (actually not a bad idea, that part). The rest were Essie Naughty Nautical (teal), Essie The More The Merrier (lime green, 2 coats), China Glaze Escaping Reality (hot pink) and, um...a black polish on top. Possibly Revlon Stiletto. Of course I had to let each coat dry before moving on, so this took pretty much forever (and made clean-up enough of a pain that my cuticle gap was more like a shipping lane). But once that was all done, I rubbed an acetone-dipped Q-Tip over parts of the nail so that it would eat away the layers to reveal the polishes underneath. 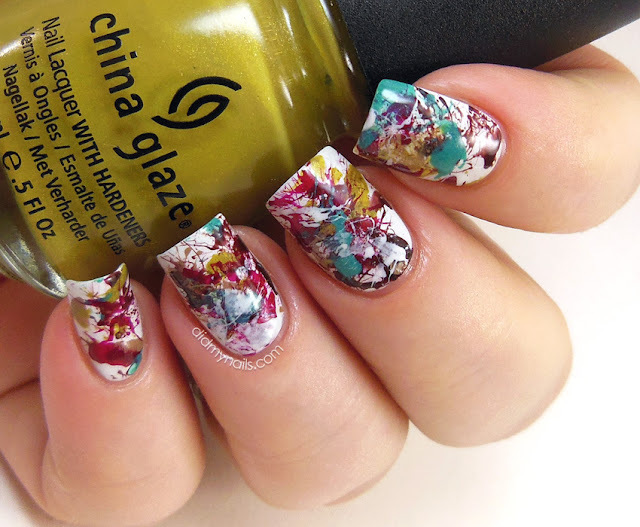 This is an awesome idea that I've seen look totally fabulous, and I love these colours together! I just need to maybe narrow them down by a couple next time and try not to get the layers so thick. And to be a little less controlled with my Q-Tip so that the "acid wash" looks more random and less spot-applied. But I think I've got the basics down at any rate, and I'm looking forward to trying this one again. Also looking forward to seeing what the other Twinsies picked for their Something New! I have another one of Lauri's amazing shimmers today that she was kind enough to send me! Quite possibly the most luminously, awesomely electric pink in the history of pink-flavoured awesomeness, this is CrowsToes Love Stinks, from February's gorgeously sarcastic ValenCrows Collection. Seriously?! Yes, seriously. This radiant pink contains the most jaw-droppingly electric shimmer I've ever seen, a bright blue that, on top of being literally dazzling already, also appears to have a fuchsia shift. It's so jam-packed that the shimmer seems to glow, looking almost three-dimensional, and I swear I need more superlatives to describe the total effect. It is le fabulous. As with the other shimmers and duos of Lauri's that I've tried, CrowsToes Love Stinks can build to a nice opacity in two or three coats, but given my stubborn VNL, I decided to layer it. I'm wearing two coats here over OPI Kiss Me On My Tulips (Holland Collection), which is just about perfect for matching undies, but any bright, medium, or Barbie pink would be a great choice for layering. I keep feeling like I should dial back the praise a little to keep from sounding biased or something, but honestly, if you think Love Stinks looks good in pictures, you should absolutely see it in real life. It is utterly freaking amazing. In addition to Lauri's blog, you can also keep up with CrowsToes on Facebook now too! 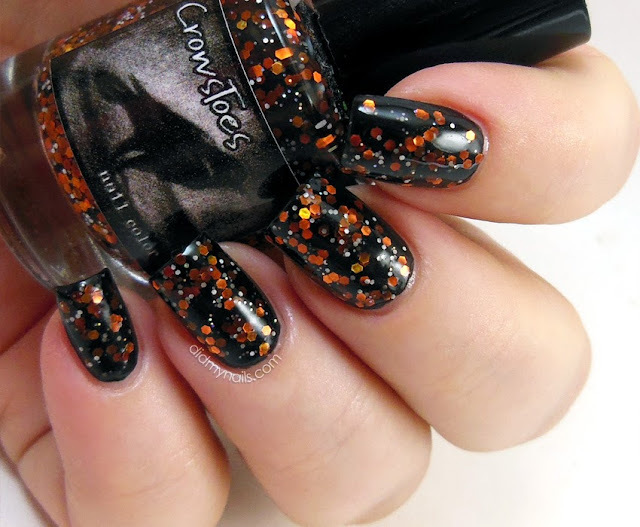 CrowsToes is available at several online retailers, including Llarowe and Overall Beauty. I did these daisy nails a little while ago, for Ellen's Going Away Karaoke Blow-Out and really liked how they came out. The idea was to do something bright and fun but not too loud (karaoke plus a pre-paid bar tab would ensure that my overall volume level was already quite sufficient), and when in doubt these days, I seem to land on floral nail art. I started these with (brace yourself for the shock) OPI My Boyfriend Scales Walls, and then I added two coats of Nubar Blank, a beautifully subtle near-sheer with a great pearlescent shimmer. 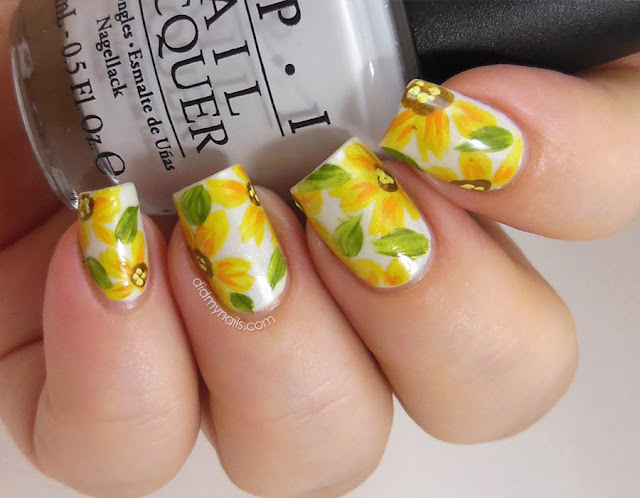 After that came the acrylic paints, starting with the yellow petals, which got some orange-y shading. Then brown centers with dots of a yellow I may have mixed a little too brightly lemon-y (filed for next time but not a huge deal). For the leaves, I swirled a couple of greens together without really blending them. 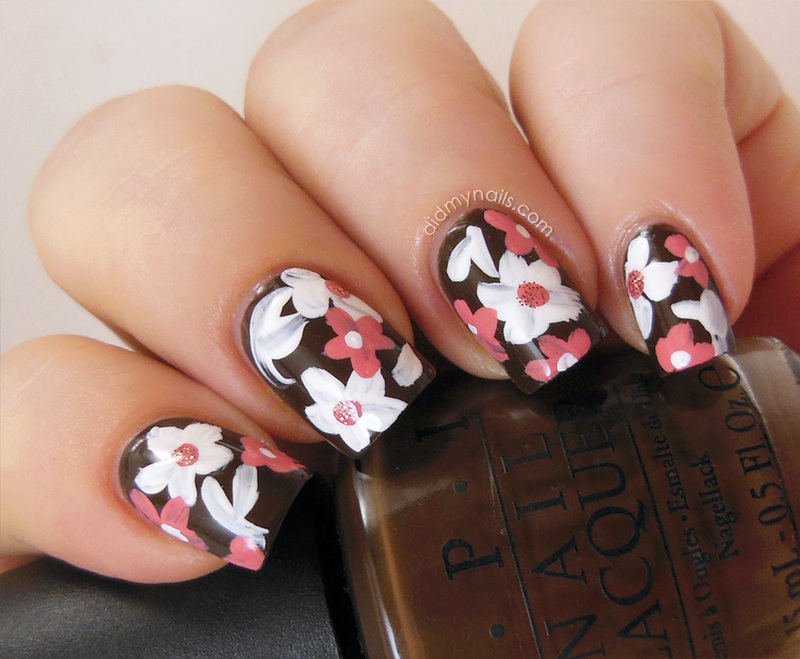 I put 'em mostly where the flowers are, but honestly, who's going to look that closely at your nails? I also scattered a few around where I just wanted a little more coverage. Anyway, liked these nails. Saved 'em for today. 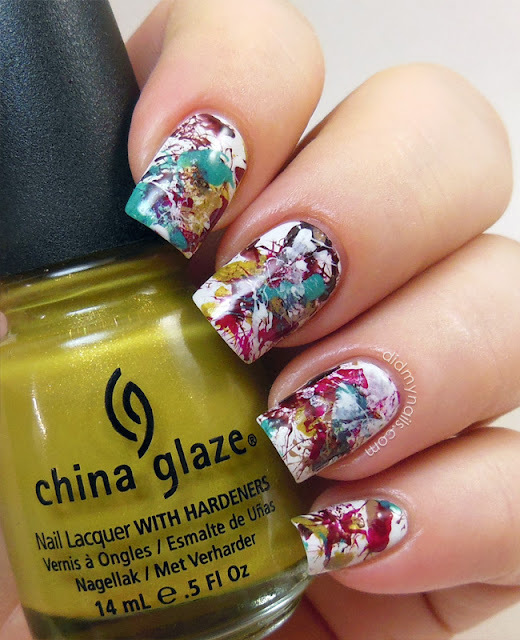 The first time I tried a splatter manicure, it looked like a clown exploded. I'm not even sure I'd have tried it again if not for this week's theme, but I'm really glad I did because it turned out so much better this time! Like, "I did this on purpose!" better, as opposed to "funhouse carnage." I started these with a base of OPI My Boyfriend Scales Walls, which I've now officially started hoarding. I literally have a backup for the backup of the backup I got to back up my first backup. Yes, I have a problem. So! After MBSW was dry, I taped off my nails (HUGE help later! ), cut some IKEA straws (allegedly good for this technique because they're a little narrower than most) into thirds, and dove in. It took me an age and a half to decide what colours I wanted to use before I realized the rug I was staring at had some pretty awesome colours, so I'd go with those...and then throw in some teal because teal because teal (and also to have something cool-toned to play against the warmer browns and reds). I picked... Revlon Colorstay Velvet Rope, a dark, smexy red I figured would probably skew a little lighter over the near-white base. OPI San Tan-tonio, a tan that doesn't show a ton with all the other colours, but it's in there. China Glaze Trendsetter, an uglyawesome lime/chatrteuse green that's also quite warm, thanks to its golden yellow undertones. China Glaze Call of the Wild, a deep, rich, reddish brown from the China Glaze On Safari collection that I keep confusing, for some reason, with the Hunger Games brown (and therefore keep wanting to call "That. Is. Mahogany!"). And then the teal, the gorgeous Essie Naughty Nautical. Once I'd mostly finished, I went back and splattered a tiny bit of white on top. It looks super obvious to me in close-up like this, but IRL it helped break up a couple of spots that were a bit splatter-heavy...though honestly, tiny detail, probably won't bother next time. And there will be a next time! I only did my four "swatching" nails this time, since I've been in a hurry to plan and schedule my out-of-town posts...and even if I had a ton of time, I wasn't feeling especially optimistic, given my previous results...but now I'm so bummed I don't have this as a full mani to wear for about a week because I LOVE it! Hopefully my fellow Twinsies have had this much fun with their splatter manis too this week--please swing by and check 'em out! They say love finds you when you least expect it, and I had absolutely no expectations of running into OPI Mermaid's Tears. I've had it on my Wish List ever since I realized I let the original release slip through my fingers, and it's been out of stock, HTF, not gonna happen ever since. But I happened to hit the store on the right day (I can only assume I'd unknowingly performed some wonderful mitzvah while the stars were in perfect alignment), and there were two bottles, just sitting on the rack and playing it cool. I, on the other hand, did not play it cool. After a hard double-take, I squeaked, grabbed, checked, checked again, jumped up and down, giggled...there might have been some light twirling... And the saleswoman was like, "I know, right?!" So apparently my giddy fit made perfect sense to her. She figured they'd been buried in the stockroom or something, and I figured that both bottles needed to come home with me immediately. I'm wearing three coats (my default) here with SV on top. No complaints about the formula, which is always so nice to be able to say about a pastel--but then I hardly ever have any complaints with OPI. Mermaid's Tears was released in spring 2011, part of the OPI Pirates of the Caribbean Collection that went with On Stranger Tides, the fourth of the Pirates movies. This was just as I was starting to get really into nail polish, so by the time I realized how obviously I needed pretty much this whole collection, it was long gone from shelves. This mint seafoam creme has a slightly "dusty" look to it, as did much of this collection, which is part of what made it so popular. And of course being minty, it lands near my very favourite shades as well. I'm still giddy beyond belief that I actually found one of my biggest lemmings just sitting out on the shelf--and with a second bottle too! That means I can actually wear my lemming without stressing too hard, which is always a plus, because a polish this awesome deserves to be worn. I'm really starting to enjoy combining nail art techniques! A few days ago I posted my Wayback nails for this month, where I swished an accent rose with my dotting tool on a saran wrap blended background. 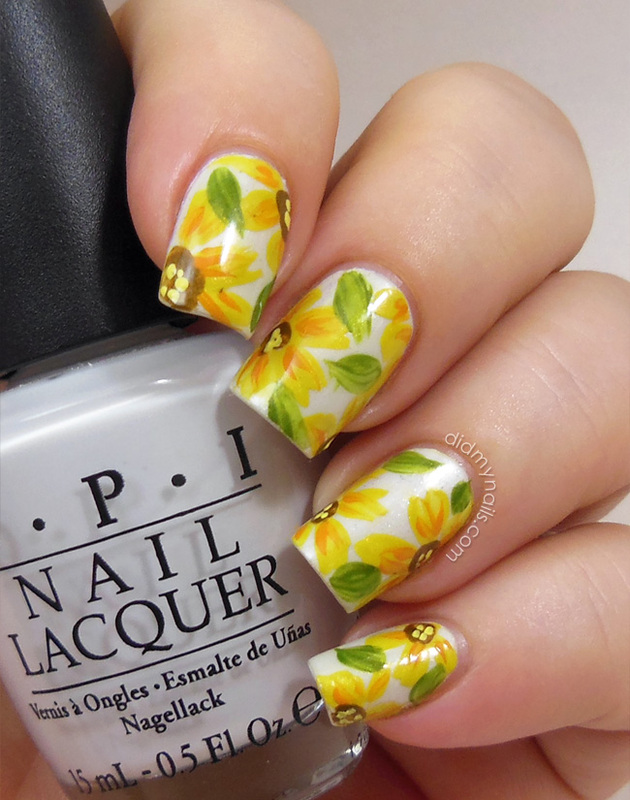 Well, today's nails are somewhat similar in principle, combining sponging and dotting to make some tiny daisies on a blended background that turned out to be a great look for summer! So! After Gumdrop was dry, I tore a corner off of a makeup sponge (I like to tear it kinda rough and craggy) and used that to apply scattered patches of China Glaze Sunshine Pop, China Glaze Gaga For Green, and Jessica Mint Mojito Green. 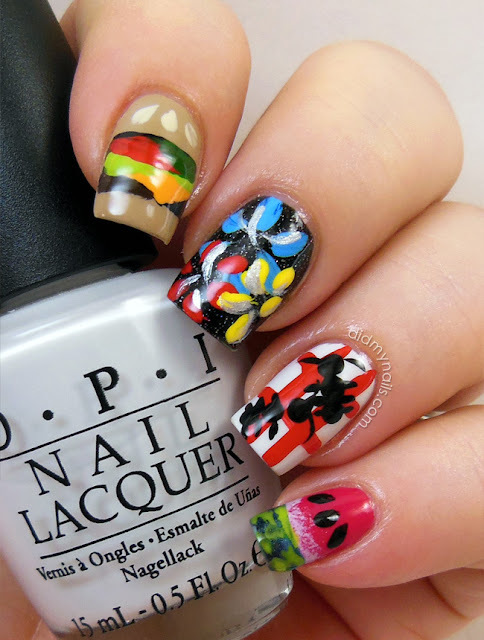 This week's TT theme is Disney-inspired manicures, and I've been so excited about it! I've had all these visions of Princesses running through my head for weeks, just trying to narrow them down...and then I remembered a picture I've had on my camera for ages. 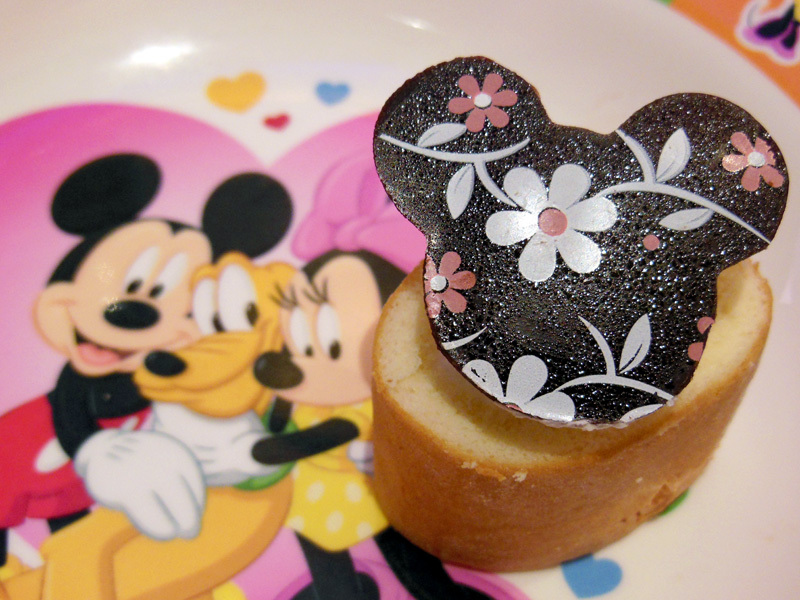 I took this about a year ago at the Hong Kong Disneyland Hollywood Hotel buffet, specifically because I thought it would make some cute nail art. 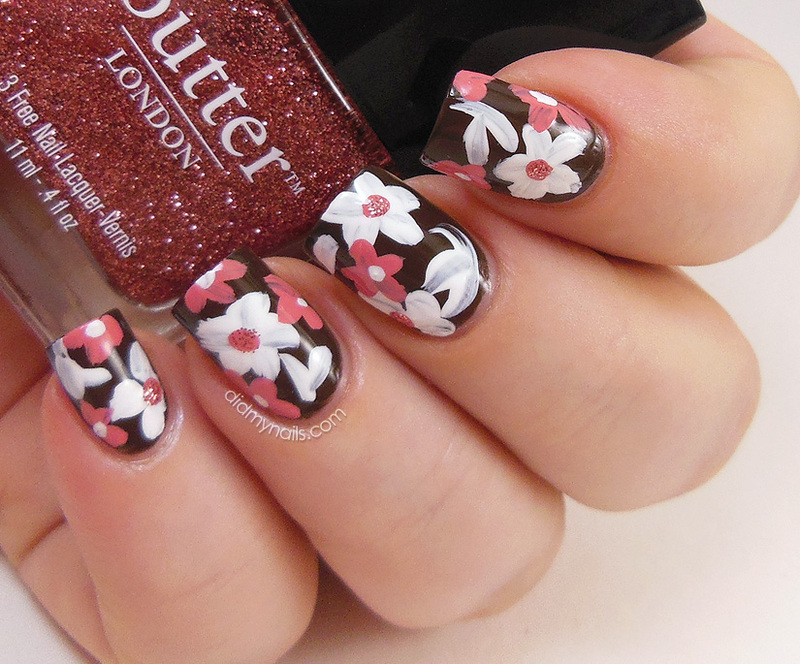 At the time I was hoping I'd stick with nail art long enough to feel like I could do something similar on my nails, and WOW, does time fly. So while they aren't princess-y in the least and not at all what I'd originally had in mind when I started thinking about this TT theme, these nails were very directly Disney-inspired. OPI Suzi Loves Cowboys makes for a great chocolate brown base (ooh, just remembered I used it as chocolate before, for my M&M nails! ), and the flowers are acrylic paints. I was pretty psyched that I'd managed to mix up a pink this close--then I got even more psyched when I realized I'd inherited a practically perfect pink glitter match from my friend Ellen's stash purge, so the centers of the white flowers are dotted with butter LONDON Rosie Lee. Anyway, once again, on to the manicure! 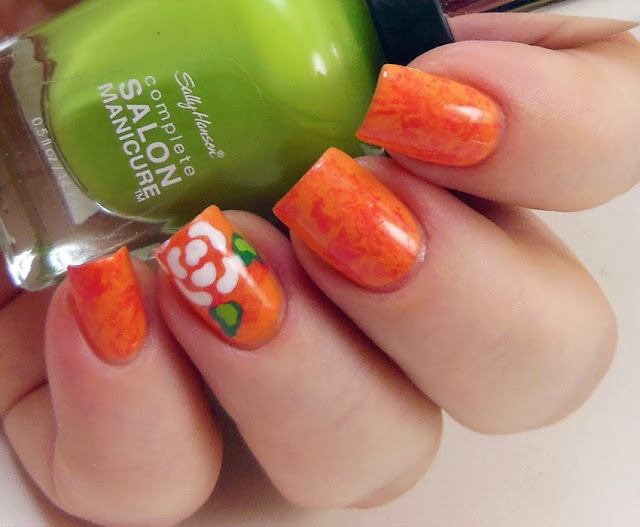 Last July I took a stab at my first freehand rose nail art and managed what I thought was a cute little accent nail. Since then I've done a lot of florals with acrylic paints, but I thought it'd be fun to go back to the basics with my dotting tool. Just like last time, I I started with a base of OPI In My Back Pocket, but I decided to give it just a little bit of texture by saran wrap applying a little China Glaze Make Some Noise. The rose is Bandi Alpine White, and the leaves are Essie Pretty Edgy and Sally Hansen Complete Salon Manicure Grass Slipper. Hmm, the nail shape is a whole lot better than a year ago, but it looks like I'm still having a little trouble with the whole white/colour balance thing. Hahahaha, and reading the post, it's obvious I'm still having a LOT of trouble getting organized before I head out of town. Serious deja vu happening here--wish me luck!! In addition to some of the Spring THIS! collection, Lauri also sent me some polishes from previous collections, and today I have swatches of Merope, from The Pleiades. Merope is a duochrome that flashes primarily vibrant plum to dusty denim. It also has--and I wish so hard I'd been able to capture this--a strong brick red at extreme angles. Yes, it will build to opacity, but it did seem a little stronger over black, which is how I'm wearing it here--two coats over Nfu Oh 132. 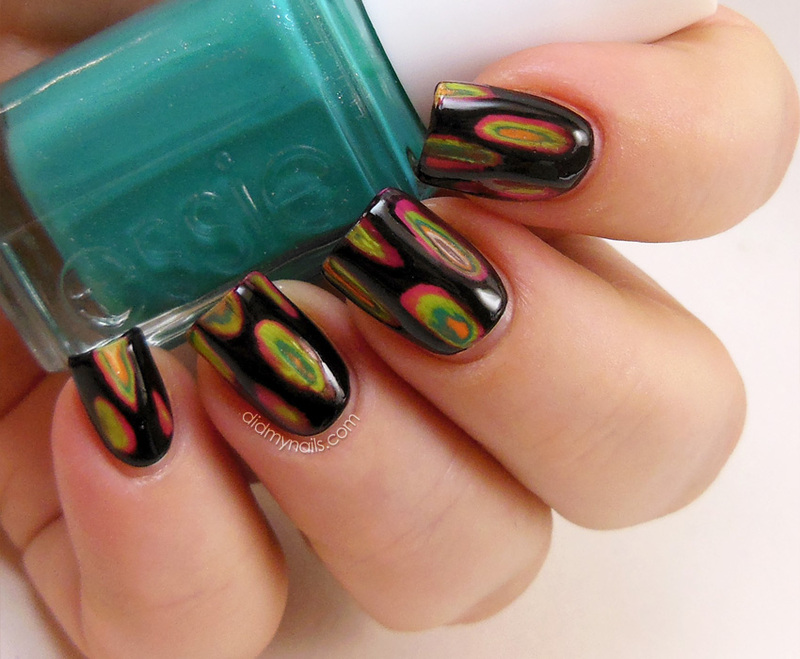 I could not take my eyes off this polish! The duo shift is so dramatic, and the combination of it and the shimmering particles in Merope is just stunning. I'm definitely going to look up more of The Pleiades! 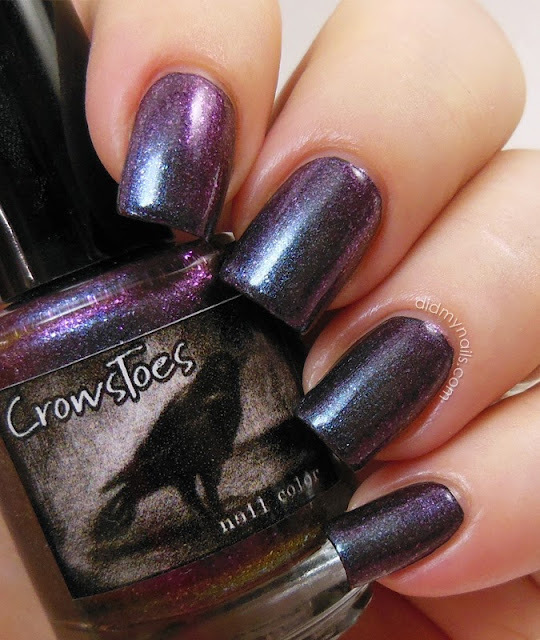 Merope, The Pleiades Collection, and other CrowsToes polishes are available at several online retailers, including Llarowe and Overall Beauty. These started with a base of China Glaze Flying High, and then I used saran wrap to add some Nubar Mystique, Essie Naughty Nautical, and Orly Pretty Ugly. The little carp fishies are acrylic paint, and then I dabbed some Orly Sparkling Garbage (would have bought that one for the name alone, even if it weren't a teal glitter) into some of the empty spaces. I hope the rest of the HK group enjoyed their manicures too (even if they did get the assignment kinda late...mea culpa, guys! ), and I'm looking forward to seeing what the other groups had for their theme! Unfortunately it's probably going to be several days before I can get online again and peek--when these posts go up, I'll be just about halfway to the States. Posts may be a little erratic for the next month until I get back, but I'll be sure to check in when I can grab some time on the interwebs! 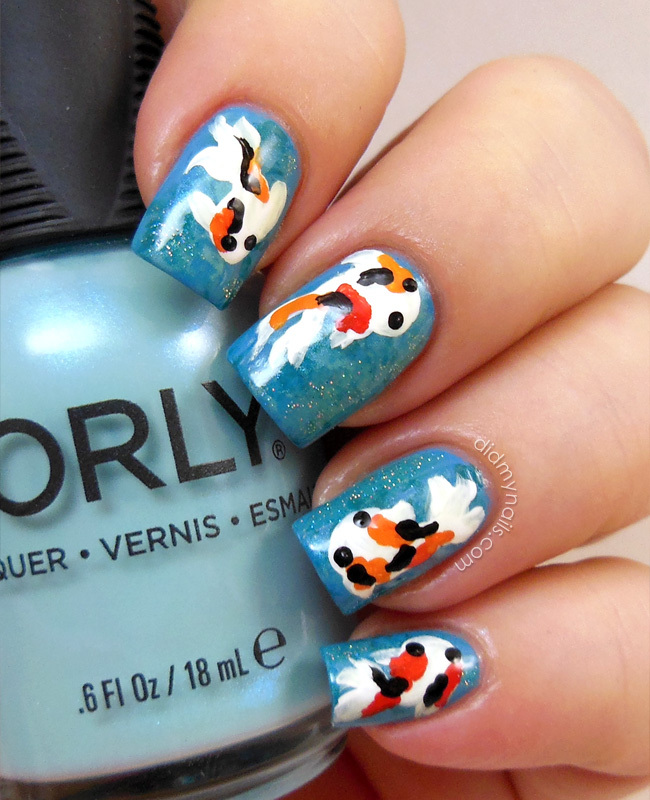 Today I have the last two polishes Lauri sent me from the CrowsToes Spring THIS! Collection, and no surprise, they are gorgeous. The first pair up was the shimmers, and the second two were micro-flakes. Today it's the glitters' turn! First up is CrowsToes Milquetoast, which I am totally crushing on. This soft, sparkly crelly features a milky white base packed with medium copper and tiny golden glitters. I've seen it build beautifully in two or three coats, but since my VNL persistently overstays its welcome (especially in macro camera mode), I did two coats over one of OPI Did You 'Ear About Van Gogh?, a pale beige that's not far from my skin tone. Love, love, LOVE! Some crelly/glitter mixes need a careful hand to look smooth and even, but Milquetoast goes on like butter. The glitter coverage is nice and even, and the pieces are beautifully suspended in the milky base. Next up is another fabulous glitter, the polish I reached for first when I started swatching these and one that I received several spontaneous compliments on, CrowsToes Shoot the Butterfly. Like Season of the Witch, this is an awesomely bold choice for a spring collection, and I didn't even realize until this minute how well it and Milquetoast complement each other! Shoot the Butterfly is a combination of medium orange and tiny platinum white glitters, suspended in a black jelly base. Less opaque than Milquetoast's crelly, Butterfly will still build to opacity at around three coats, but once again, I chose to layer. Shown here is about a coat and a half over Revlon Stiletto (black). The first time I wore Shoot the Butterfly, I was at the mall downstairs, and one of the cashiers was so taken with my nails, she pulled them closer for a better look and kept demanding to know where I'd had them done and how much it cost (this seems to happen when I wear CrowsToes). The second time, someone whipped out her camera to take pictures of my hands and show a friend. It would appear that CrowsToes is a hit in Hong Kong! For bonus levels of awesome, Shoot the Butterfly reminds me of The Monarch, from The Venture Bros.
Today I'm delighted to post two more of the polishes Lauri sent me from the CrowsToes Spring THIS! collection. In part one of Spring THIS!, I mentioned that in addition to her stunning glitters, Lauri also does beautiful duochromes and shimmers, and she continues to expand her repertoire with these gorgeous greens--they're absolutely packed with colour-shifting micro-flakes! First up is CrowsToes Green Thumb of Doom, a bright, springtime green that's bursting with duochrome, micro-flakie goodness. These lemon-lime, shimmering flakes are suspended in a jellyish base that I've seen build to opacity in around 3 coats, but with my stubborn VNL, I layered two over Essie Mojito Madness and then sat back and goggled at the fabulousness. 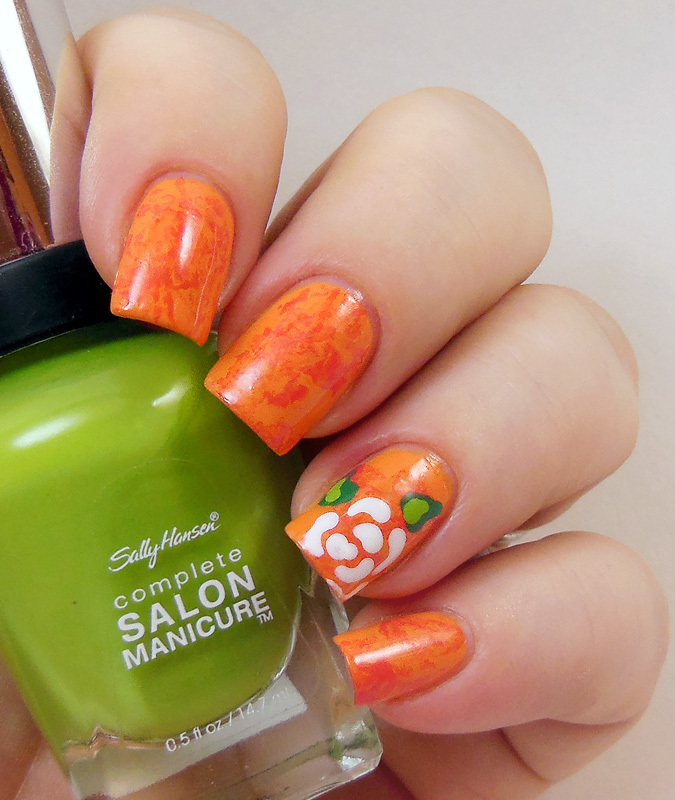 This is such a great shade of green--a little bold but still soft and refreshing--perfect for a spring/summer polish! The way the light practically dances off these shimmering particles, they could easily be glassfleck, but sure enough, they're the tiniest flakies I've ever seen, shifting from lemon yellow to lime green, even hinting at an icy blue at extreme angles. I definitely recommend this polish if you have any fondness for greens, shimmers, duos, flakies, glassfleck, springtime, or things that are awesome. Next up is CrowsToes Season of the Witch. It's also loaded with color-shifting micro-flakes, this time flashing from bright green to vibrant violet (even throwing in a little teal at some angles). Season of the Witch will build to opacity on its own, but I'm wearing two coats here over Revlon Stiletto. That shift is not shy in the slightest! I just love seeing a bold choice like this in a spring collection too. It may be dark, but there's nothing drab about it! I have two more polishes to post from Spring THIS!, as well as a few others Lauri was sweet enough to send me, and my fingers are crossed SO HARD right now...like I did last summer, in a few days I'm heading to the States for about a month, and I have about 14 thousand things on my to-do list between now and then, including so. many. 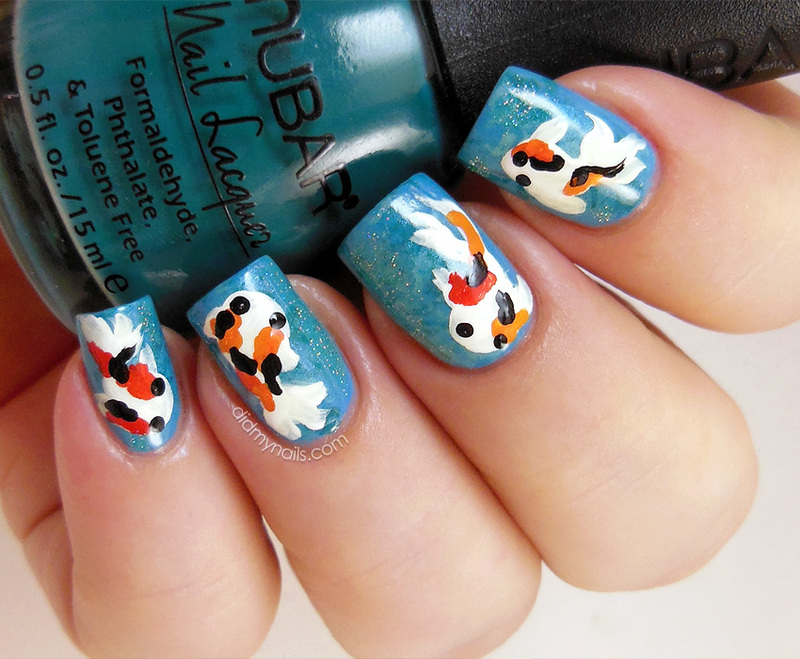 nail posts. Please wish me luck!! CrowsToes can be found at several places online, including Llarowe and Overall Beauty. For more, and to keep up with CrowsToes news, you can check out Lauri's blog, the Polished Crow! Whoo, time really got away from me these past few, but Twinsie Tuesday should have me back on track with this week's theme, nails inspired by the 4th of July, aka American Independence Day. Mine are a backyard BBQ! And left to right... For the cheeseburger on my index finger, I didn't actually have a good "burger bun" tan, so I mixed together 2 drops each of OPI San Tan-tonio, China Glaze Kalahari Kiss, and Revlon Elegant. The actual burger bits are all arylic paint, as are the fireworks (...ish...) bursts on the middle finger, which I swooshed on over Docile D224 for a little bit of night sky sparkle. Ring Fingy is the ubiquitous red and white picnic table cloth, complete with equally ubiquitous picnic ants. It's red striper over OPI My Boyfriend Scales Walls (best. white. EVAR. ), and the ants are dotted polish and a little black striper. I expected ants to be easier than they apparently are... Mine look more like cooties from that Hasbro game I never played right because I was having too much fun building the little cootie guys to bother taking turns (plus that's how you roll when you're an only child). So yeah, pinky is watermelon like I did last summer, and them's my Fourth of July nails! 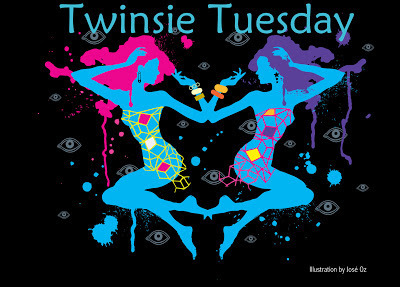 Looking forward to seeing my fellow Twinsies' interpretations too--have a great 4th and stay safe, y'all!